The organizers of the event have included several great speakers, a workshop for brokers and office owners, and the Star Awards Night that presented awards to the best from the RE/MAX group. 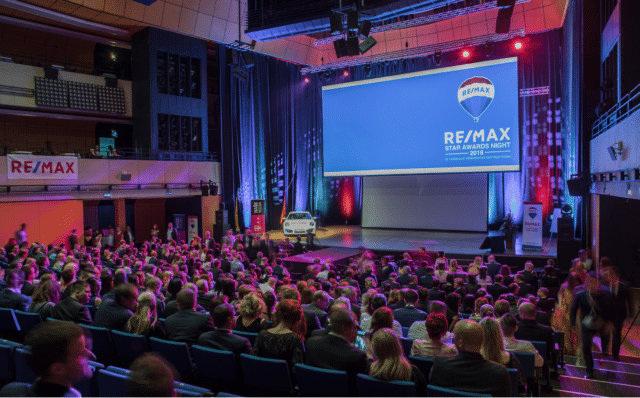 After the opening speech of the president and founder of RE/MAX Czech Republic, David Krajný, and Regional Director of RE/MAX Slovakia, Richard Churý, CEO of RE/MAX Europe, Michael Polzler, gave a lecture on the use of modern technologies and locations. The practical demonstration of how to work with contacts and pleasantly surprise them was demonstrated by the excellent Elhorry Zunino, Luxembourg office director and RE/MAX Immo Specialist. Right from the stage, he called his friend to wish him a Happy Birthday. During the Star Awards Night, the winners of each category were announced, such as Worker of the Year and Broker of the Region. The total proceeds of the Philanthropist of the year in 2018 were also presented. It was possible to join this project, which was made possible through the Tereza Maxová Foundation for children whom RE/MAX has been collaborating with since 2015, by contributing any amount online. RE/MAX headquarters doubled every 1 Czech Crown raised. This year’s check for the final amount of CZK 309,310 will be distributed by the Tereza Maxová Foundation to three pre-selected projects. The check was taken over by the director of the Terezie Sverdlinová Foundation. As part of its four-year cooperation with RE/MAX, C-IN took care of all organizational services, both during the preparation of this educational and social event and during the event itself. In addition to the production and technical provision of a demanding program, the C-IN team took care of VIP guests and performers during their stay in Prague. We are already looking forward to next year!